Yesterday I got back from my desk after a most relaxing and inspiring Easter break in Stockholm. After time away from my screen I always get the urge to get back and create work I can be proud of. I feel the urge for self-improvement and once again it becomes the time to get organised. It is the season for Spring cleaning after all! 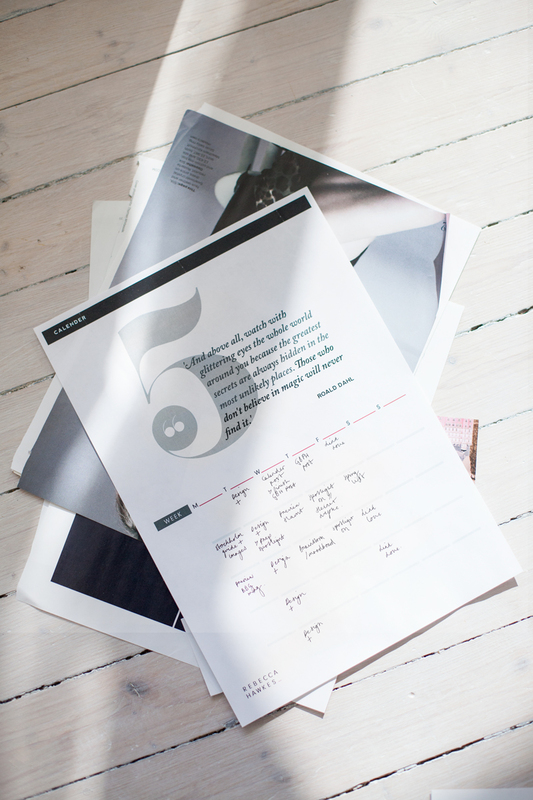 Previously I had been using the minimalist A3 calendar designed by Love Aesthetics and was really loving that there was no set dates and was clear to see what needed to be done. I have never been good with numbered journals or diarys as at a certain point of the year I become a bit slack with updating it. I hate wasting beautiful stationary! It only seemed natural when the urge to be organised reared its head again that I should create my own calendar to fit my needs. I am sharing it here with the hope it can help you too. It will soon to be May, and although this calendar has no specific dates I have worked with a large number ‘5’ symbol for this reason (you haven’t missed previous calendars!). 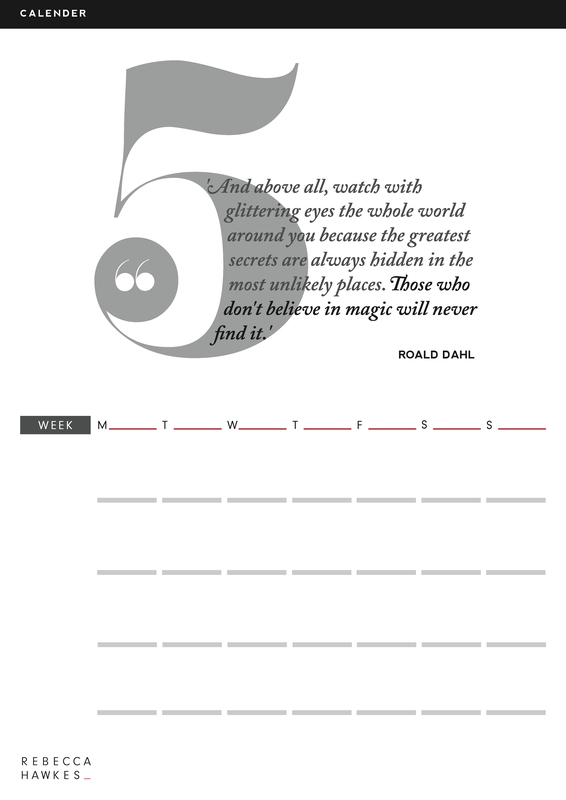 I also wanted to set a tone for the rest of the month so looked to one of my favourite quotes from the ever amazing, Roald Dahl. This quote always inspires me to look for beauty and magic in the everyday. The days are simple and I’ve allowed you to add in the week number yourself so that if like me you choose to use this calendar for a different month in the year. 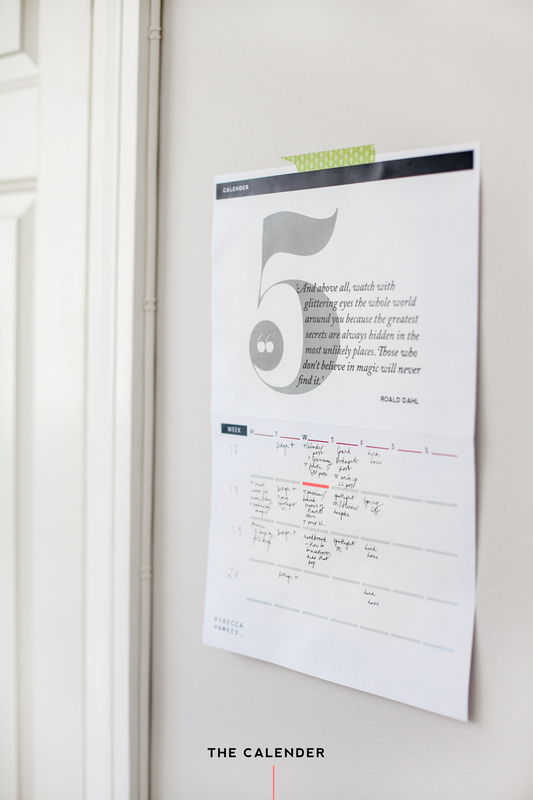 When designing this calendar I wanted to create something that I could visually mark my effort to stick with a goal. I recently listened to a podcast from Designsponge, ‘After the Jump’ that spoke to waking up early and getting into the habit of marking a large ‘X’ on a calendar once you have completed a task that is part of a larger goal. All you need to do is repeat this task and don’t break the chain of red ‘X’s. Being visual this idea speaks to me and I hope it will help me with my quest to learn Norwegian. There was one problem I had with this idea, however, the aesthetics of the ‘X’. I am being particular but visually, to me, it looks messy. Instead with this concept in mind I added a light grey box bellow every day. This is to be highlighted after each task, to keep both you and I aware of our achievements, and overall goal.